It’s official. 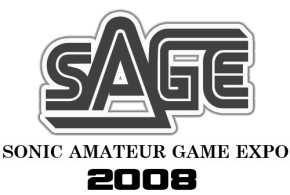 SAGE 2008 is underway. The sleek new portal site debuted this morning, and with it, more than fifty games are available for viewing in a nice carousel format. Viewers are able to rate each game with a thumbs up or thumbs down feature right on the interface. The big titles right now include the new, purported final demo of Emerald Ties: Crossing Fates, with (at press time) 78 thumbs up compared to just 19 thumbs down. The discontinued Sonic 1 Megamix is also a big winner with fans, with a 70 up/21 down ratio. The open-source 3D title Sonic Bastardized is also getting pretty glowing support, with 44 thumbs up and 21 down. Mecha Madness, which saw an early demo release ahead of the expo’s official opening, joins Sonic Rebirth with 35 thumbs up each. Sonic: Time Twisted, one of the original promoted games as the expo, has a bit of a split decision under its belt, with only 21 thumbs up and 12 thumbs down. Nothing: A retro-style action/adventure game starring a quadruped. Halo: Out with a Whimper: Halo: Out With a Whimper is a 2D Halo Fan game by Triblox Games and the OWaW team. The game brings a new twist on the Halo series featuring a main character the player names. The player, as the game begins, has been captured by covenant forces and is being held on a Covenant Cruiser. After making an escape in an ensuing battle over the colony world “Atlas”, the player makes contact with Highcom below. Heading to ground, a squad of ODST’s aids you in your new mission, to fight off an invading Covenant Fleet the best way you know how, with your rifle, your warthog, and a few grenades. Find out the fate of this world at war this winter! Mario Roots: Embark on a great journey to take Mario back to his roots to undo the evil that has plagued the Mushroom World. Scorching Strings: Scorching Strings, a Guitar Hero/Rock Band fangame, is coming out sometime in the near future, but unfortunately, not in time for this event. Check out our website for more information. The Last Adventure: We, the Mix Maker Corp. (mix-maker-corp.ueuo.com) is a studio Portuguese of Energy Games (energy-games.ueuo.com) that creates games. The Last Adventure is our first game and only after several failed attempts in other projects. It is an RPG with 3 versions (Hero, Magic and Dark edition) that promises to be innovative, even with the 2D. You have all, as maps, meeting rooms, so the story to be a good RPG. Somari Insanity: Play as sonic or mario! Use special move and tactics to save the Mushroom Kingdom! Blue Frenzy’s lil Secret Project: From the creator of Sonic Frenzy adventure, you have this original game. A must play for every Zelda, Wonder boy, Castlevantia or Metroid lovers. This includes a demo with the full first dungeon and firs tfield section done and a lot of information, aside from tutorials and a walkthrough. We also know that the chat with Naughty Dog’s Eric Iwasaki, which we brought to you First @ TSSZ, will be happening tonight from 6PM-8PM ET. Lee Brotherton will be in chat on Tuesday. We have SAGE totally covered. Our team will be giving you the news and chat developments from the expo, and we’ll have Ryan Bloom and Paul Street reviewing all the demos that are fit for print. Stick with us throughout the week for unrivaled coverage of the latest Sonic Amateur Games Expo.